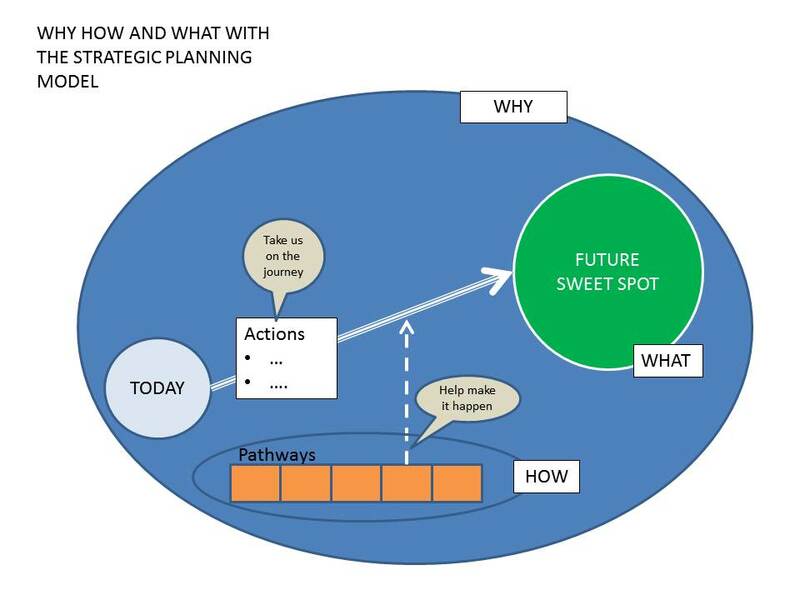 Why How What and the strategy model. Readers of my posts will know that I am a big fan of Simon Sinek and his book “Start With Why”. Groups, teams or organisations who struggle to articulate their WHY probably also struggle with how to stay ahead of the game, choose strategies and implement actions that support their beliefs. SoI have been working on laying the WHY model over the Strategy Model and see where I believe they fit together. I think that the WHY of the organisation or group can be covered by their whole ecosystem, their whole reason for being, their now and their future. When looking at your own situation if the desired WHY and the model don’t align then either the WHY isn’t what you thought you believed or your strategy isn’t taking you there! And vice versa. If you have alignment then the actions that you are taking to get you to your desired goals and objectives (thoses things most closely linked to your WHAT) will be easily articulated and more readily accomplished. And finally HOW, these, I believe, are aligned to the enablers or pathways that help us make the actions happen. So what do you think? Do the WHY model and the Strategic Planning model interlink just like a puzzle coming together, or is there no need to complicate each with the other? Let me know what you think? One of the things I encourage people to do at my workshops is to set personal goals. It is a great ice breaker and gets people focused on the future. I ask them to write down 10 things they would like to achieve in the next twelve months, place it in an envelope and date it. There are no boundaries to what people are allowed to write, it can be professional development right through to relationships or financial gain. And importantly it is private, no one is asked to share what they have written! It is amazing how many of those objectives people find they have achieved when they break open their envelope after twelve months and review the year just gone. Better than 50% of the objectives are usually met and a typical benchmark is closer to 80%. Review how you went over the last twelve months and repeat the process so you Renew your objectives for the next twelve. It only takes a few minutes, go on do it now before some pressing item comes across your desk! Oh, and put a diary entry in for twelve months time so you remember to Review and Renew every year!